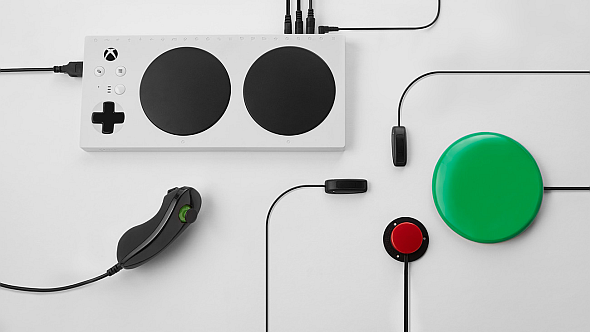 Update May 17, 2018: Microsoft have officially unveiled their accessible controller. It will be called the Xbox Adaptive Controller, and has been designed in collaboration with Special Effect and AbleGamers, charities that aim to help gamers with disabilities enjoy our awesome hobby. If more people can play the best PC games, that’s a very good thing. The key word in the controller’s billing is ‘adaptive’. It is highly customisable, with nineteen 3.5mm input jacks and two USB ports, which will be able to receive most specialist input devices right out of the box. There are two large programmable buttons with very light resistance, for those with strength difficulties. You can also set up three custom profiles, to enable easy switching between your favourite games. 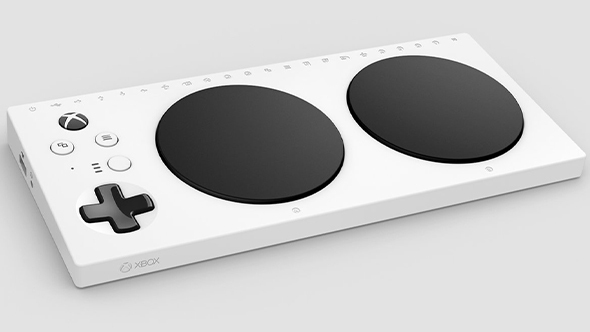 The Xbox Adaptive Controller – or XAC – will cost $99. For more information, Microsoft have an in-depth story on its development. The XAC will surely be compatible with PC, given Microsoft’s efforts to unite Windows 10 and Xbox, and this makes today’s announcement even better news. For all its precision and flexibility, mouse and keyboard isn’t the most user-friendly input system, and any controller that can bring PC gaming to a wider audience is to be welcomed. Original story May 14, 2018:Somewhere between the 360 and Xbox One, Microsoft’s first-party controllers became the standard forgamepads on PC, with easy plug and play operability across pretty much every game you’d want to use a pad with. Now, if an apparent leak is to be believed, it seems like they’ve got a new option on the way built to make gaming accessible to more people. Images of a new controller have appeared on Twitter, courtesy of serial Microsoft leakerWalkingCat. The controller features a direction pad, Xbox home button, the start and select stand-in symbols, and two giant pads marked A and B. We don’t know what this controller is called, but judging by the massive buttons it’s likely to be an accessibility controller for those with disabilities limiting their access to standard gamepads. This controller appears to feature a USB port and headphone jack on the side, and all the standard Xbox controller functions – plus some extras – are arrayed as symbols at the top. There are also what appear to be three LED lights which look similar to those we’ve seen on the leakednew Xbox Elite controller. We won’t know for certain until information becomes officially available, likely at E3, but signs point to a programmable controller built for gamers with special needs. Accessibility is starting to become a more active concern for many developers and hardware makers, with one recent example being the EyeMine eye-tracking software for Minecraft.